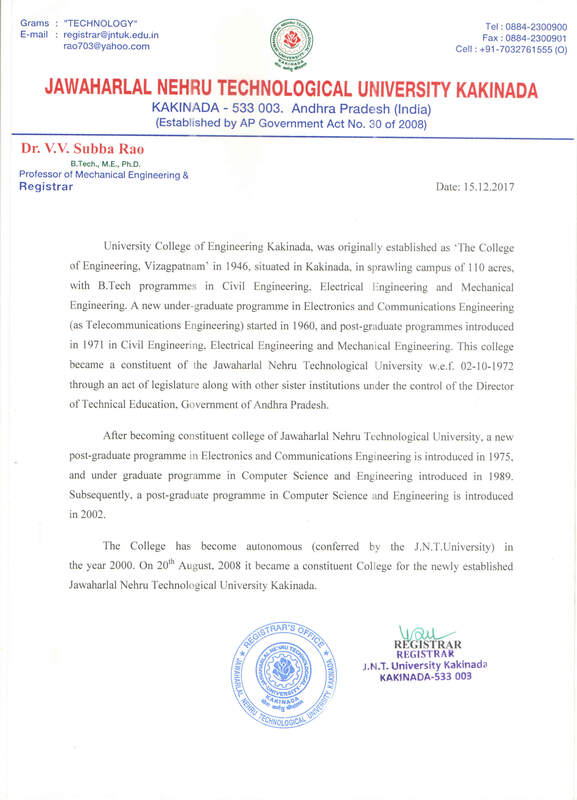 Department of Electronics and Communication Engineering, Univercity College of Engineering JNTUK. The Department of Electronics and Communication Engineering in this Institute is the first department established in the state of Andhra Pradesh as Telecommunication Engineering Department in 1958 and is one of the oldest departments in the country and later renamed as Department of Electronics and Communication Engineering. The Department of Electronics and Communication Engineering has contributed many stalwarts to serve the mankind all throughout the world through its committed academic legacy. The Department of Electronics and Communication Engineering and its alumni are mutually proud of their achievements. The department has celebrated Golden Jubilee Year in 2008. The department of Electronics and Communication Engineering has well qualified and experienced faculty with excellent infrastructural facilities. The department offers both Under Graduate and Post Graduate programmes. To remain a symbol of pride in the fields of Electronics and Communication Engineering by producing holistic and diligent Engineers for industrial and societal needs. M1: To produce high quality learners who are globally competitive and professionally challenged in the field of electronics and communication engineering. M4: To build up the state of art laboratories and centers of excellence in different areas of electronics and communication engineering. M5: To train the students and faculty to update their knowledge in pioneering technologies to meet industrial requirements. PEO 1: Do extremely well in professional career and higher education by attaining knowledge in mathematical, computing and engineering principles. PEO 2: Analyze real life problems, design systems appropriate to its solutions in the field of electronics and communication engineering that ate technically sound, economically feasible and socially acceptable. PEO 3: Possess good communication skills and ethical attitude with ability to work in teams and adapt to current trends by engaging in lifelong learning. PEO 2 : Expertise in carrying out project works in advanced communication engineering by using state-of-the-art computing techniques and to develop interdisciplinary research. PEO 3 : Possess good communication and presentation skills with ability to work in teams and contributing massively to the technological development of Nation. PE0 1: Attain technical knowledge for specialized careers in instrumentation, control systems and related fields that cater to the Global needs. PEO3: Possess good communication and presentation skills with ability to work in teams and contributing massively to the technological development of Nation. PEO 1: An ability to apply knowledge of computing, mathematics, science and engineering fundamentals appropriate to the discipline. PE0 2: An ability to analyze a problem, and identify and formulate the computing requirements appropriate to its solution. PEO 3: An ability to design, implement, and evaluate a electronic-based system, process, or component to meet desired needs with appropriate consideration for public health and safety, cultural, societal and environmental considerations. PEO 4: An ability to design and conduct experiments, as well as to analyze and interpret data. PEO 5: An ability to use current techniques, skills, and modern tools necessary for designing practice. PEO 6: An ability to analyze the local and global impact of computing on individuals, organizations, and society. PEO 7: Knowledge of contemporary issues. PEO 8: An understanding of professional, ethical, legal, security and social issues and responsibilities. PEO 9: An ability to function effectively individually and on teams, including diverse and multidisciplinary, to accomplish a common goal. PEO10: An ability to communicate effectively with a range of audiences. PEO11: Recognition of the need for and an ability to engage in continuing professional development. PEO12: An understanding of engineering and management principles and apply these to one’s own work, as a member and leader in a team, to manage projects. PO 1 : The graduate will be able to acquire in depth knowledge in the area of computers and communications with emphasis on communications. PO 2 : The graduate will be enabled with the capabilities of critical thinking, analyzing real world problems and handling the complexities to arrive feasible and optimal solutions considering societal and environmental factors. PO 3 : The graduate will be enabled with lateral thinking and problem solving capabilities in the area of computers and communications with emphasis on communications. PO 4 : The graduate will be able to extract information through literature survey and apply appropriate research methodologies, techniques and tools to solve problems in computers and communications with emphasis on communications. PO 5 : The graduate will be enabled to use the state-of-the-art tools for modelling, simulation and analysis of problems related to computers and communications. PO 6 : To inculcate leadership and entrepreneurial skills so as to enable the students to work in a challenging and interdisciplinary environment. PO 7 : The graduate will demonstrate knowledge and understanding of computers and communications with emphasis on communications and management principles and apply the same for efficiently carrying out projects with due consideration to economical and financial factors. PO 8 : The graduate will be able to communicate confidently, make effective presentations and write effective reports to engineering community and society. PO 9 : The graduate will recognize the need for life-long learning and have the ability to do it independently. PO 10 : The graduate will become socially responsible and follow ethical practices to contribute to the community for sustainable development of society. PO 11 : The graduate will be able to independently observe and examine critically theoutcomes of his actions and reflect on to make corrective measures subsequently and move forward positively by learning through mistakes. PO 1 : The graduate will be able to acquire in depth knowledge in the area of instrumentation and control systems with an emphasis on industrial process control and instrumentation. PO 2: The graduate will be enabled with the capabilities of critical thinking, analyzing real world problems and handling the complexities to arrive feasible and optimal solutions considering societal and environmental factors. PO 5: The graduate will be enabled to use the state-of-the-art tools for modelling, simulation and analysis of problems related to instrumentation and control systems. PO 6: To inculcate leadership and entrepreneurial skills so as to enable the students to work in a challenging and interdisciplinary environment. PO 7: The graduate will demonstrate knowledge and understanding of instrumentation and control systems and management principles that apply the same for efficiently carrying out industry-oriented projects with due consideration to economical and financial factors. PO 8 :The graduate will be able to communicate confidently, make effective presentations and write effective reports to engineering community and society. PO 9 :The graduate will recognize the need for life-long learning and have the ability to do it independently. PO 10: The graduate will become socially responsible and follow ethical practices to contribute to the community for sustainable development of society. PO 11 :The graduate will be able to independently observe and examine critically the outcomes of his actions and reflect on to make corrective measures subsequently and move forward positively by learning through mistakes.